How do you see our high streets in five and 20 years time? What can be done about transport and parking? How can the high street become a place of opportunity for youth? How can it become a hub for skills sharing? How can the street landscape be improved? What can we do about parking in Highgate High Street? Give us your views on how we can improve parking in the Village. How can we resolve the competing needs of visitors, businesses and residents? And what about the high levels of pollution on our high streets? A new blog sets out the issues and calls for your solutions. Clear your diaries for June 15 to 23! Highlights this year include a day (Sun 16) of live music and shows presented by locals on Boogaloo Radio, young musicians and singers paying mini-concerts at various venues and numerous walks, talks and tours on anything from slavery and radical thinking to our great trees and pubs. Blacktooth Productions will stage a History of Highgate, there will be a screening of The Ponds and an eco-event at Omved Gardens. But we are still keen to hear from individuals or groups of friends who want to organise or host something small – a play in your living room, a tour of your strange collection, or having a go at an open mike night etc. please email info@highgatefestival.org to join in. Oh and our “pink provocation” plaques have already caused a stir in the media – watch this space for more! Prof Jeff Duckett will lead a botanical ramble through Queens Wood on Sat 13 April from 2-4pm. Assemble at the cafe with suitable footwear. There’s also another of his popular tree talks from 2-4pm this Saturday 23rd in the Highgate Library (Shepherds Hill). The very active HNF tree group have also met the new Haringey tree supremo and will be restarting their tree survey in April. The down escalator at Highgate Underground Station is currently out of action while being refurbished. Travellers who are unable to walk down 118 steps to the platforms are advised to use local buses or Archway Underground station. This will include meeting specialist police units including Police search dogs, Marine Support Unit and Police Horses. 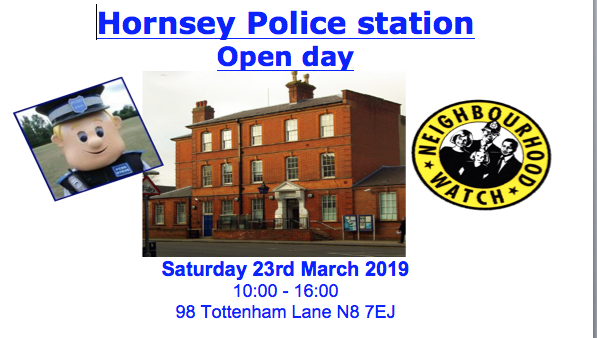 Take a tour of Custody and inside a prisoner cell and have your photo taken in vintage police cars. All welcome. Running from 1-7 May, Rewind/Rewild will explore the ecological implications of rewilding and the broader possiblities for rewilding human lives. Featuring artworks that foreground, analyse or challenge human relationships with plants, animals and landscapes, the exhibition considers the need for humans to re-engage with the natural world. More info here. Let us know if you want us to include an event or campaign you are running in this newsletter via info@forhighgate.org. ← High Street parking solutions please!